Registering for FireCloud is free! This will allow you to browse public workspaces, methods, and datasets. However, you must have access to at least one FireCloud Billing Project in order to create or clone a new workspace. After you register, please refer to this tutorial on how to set up billing so that you can proceed with creating a workspace. This can be a Gmail account, an institutional Google Apps account, or any Google Apps account that you create. 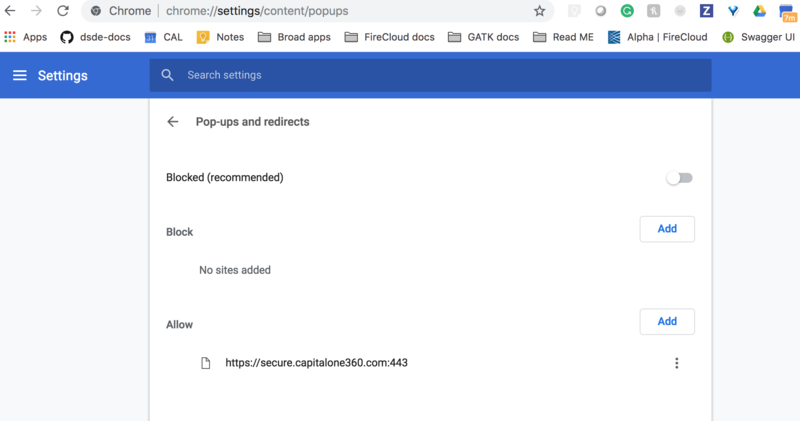 Note that you can create a Google Apps account associated with your existing email address; as explained here, using a Gmail address is not required. 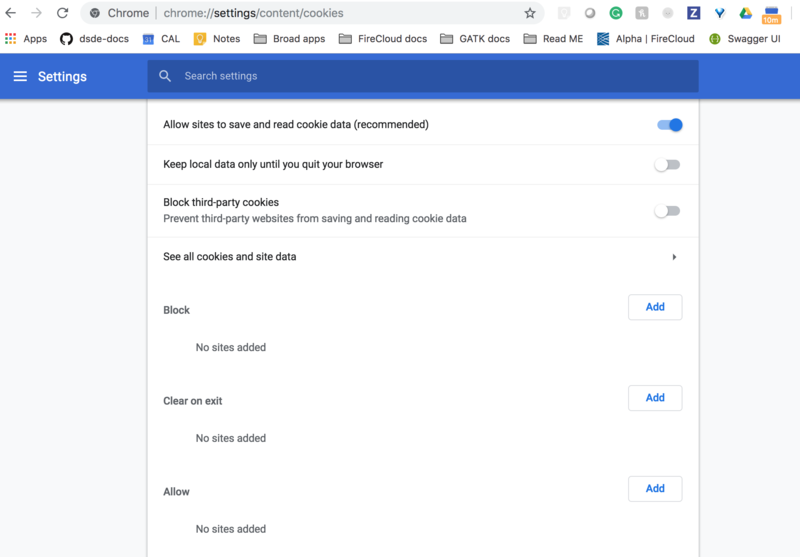 Ensure your Google Chrome browser settings are configured correctly. See the instructions below for guidance. Using Google Chrome, go to the FireCloud portal or click on Use FireCloud in the top menu bar of the documentation website. Click Register, then Sign In with your Gmail or Google Apps account. When asked to allow FireCloud to view your email address and basic profile info, please click Allow. You can find an explanation of what this entails in the FAQs. You will be prompted to enter New User Registration information. Please add your first and last name, along with the other required (*) fields. After entering your registration information, click Register. Note that you can optionally provide a Contact Email to receive information to help you get started, as well as periodic notifications. We recommend providing a Contact Email if the Gmail or Google Apps account you use to register for FireCloud is not your primary email. If you do not provide a Contact Email, we will send notifications to your Gmail or Google Apps account. Sometimes after folks register and sign in they see a blank screen. The two most common reasons for this lie behind the browser settings. Try one of these methods in Google Chrome if you run into this problem.